Mercato Centrale Brings ‘Food Tourism’ to SM Mall of Asia this July! Did you know that one of top tourist destinations in Manila is the SM Mall of Asia? And what’s one of the best ways to welcome foreign guests to one of Manila’s top tourist destinations?- By sharing with them a variety of great-tasting dishes from different parts of the Philippines! 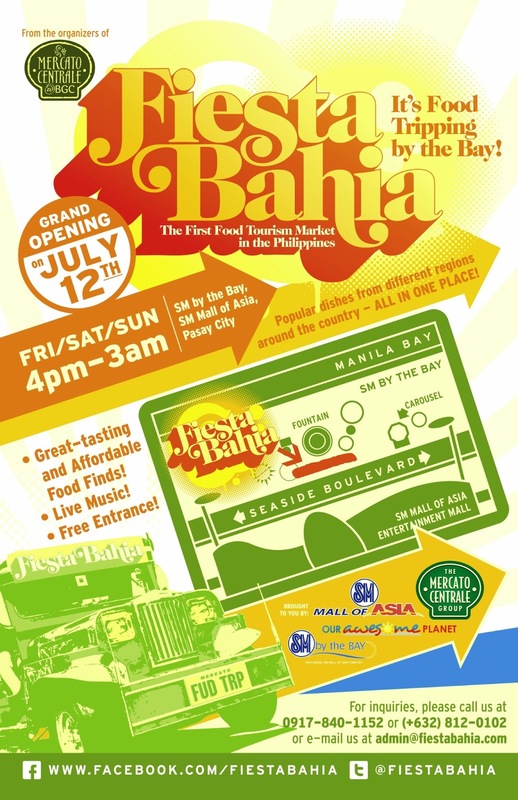 That’s why the Mercato Centrale group, the organizers of Metro Manila’s premier night food and lifestyle markets, is bringing a new ‘food destination’ experience to the SM Mall of Asia By the Bay with Fiesta Bahia – ‘the food tourism’ market – every Friday, Saturday and Sunday starting July 12 (Friday) from 4pm to 3am. “In an interview with Today Show food blog, Bizarre Foods host Andrew Zimmen predicted that Filipino will be the next big thing. Chef and culinary expert Anthony Bourdain of “No Reservations” also shared in his blog on the Travel Channel website that he enjoyed sisig and Cebu lechon during his visit to the country.” said Anton Diaz, co-founder of Mercato Centrale and the popular food and travel blogger behind www.OurAwesomePlanet.com. For interested food vendors who want to join Fiesta Bahia, please contact (+63 917) 840-1152 or (+632) 812-0102 or admin@mercatocentrale.ph. We are prioritizing vendors who specialize in regional/provincial food. The more unique, the better! Oooh, I'm gonna be looking forward to this one! I've been a fan of Banchetto, Mezza Norte, and Mercato. Thanks for this! By the way, I saw your blog from somewhere, and I don't exactly recall when. Nice to be stumbling at a mostly-food blog. I've been eating a lot since time immemorial as well and I'm almost always on the look-out for the next splendid food spot.